I started using flash demonstrations on my web sites a few years ago. The first time I implemented them, I ordered demonstration manuals that actually didnt even have any audio, just demonstrations. Each set of videos would sometimes take weeks to develop and deliver. And yes, I had to cough up hundreds of dollars for each set. Nevertheless, when we put these on our customer support page, our support tickets drammatically reduced by as much as 50. These only /covered a few subjects on our web site; so over several months I ordered an almost complete set of every support issue I could think of. Dont forget, we still use these videos, although we are now slowly moving to the new generation full motion videos with audio, such as the ones made by Instant Video Suite. This gave us the opportunity to concentrate more on marketing and getting more sales; after all, there were hardly any support requests any more. In fact you had to spend over $500 to do all this. And even then, none of these products came anywhere close to what Instant Video Suite does for you at just a fraction of the cost. And you still had to have some technical expertise, and go through a couple of steps before you could produce the final videos. Whether you sell products or services, even if you do it offline, a live touch will certainly close more sales for you. Instant Video Suite can transform your online business into a money-making monster and allow you to dominate your niche without mercy even if youre just getting started. The possibilitites are just endless. Plus, you do not need any multimedia, web design or programming experience to accomplish this and a lot more. In short, you can transform your website into a cash magnet easily through making just small changes with no trouble at all in very little time. These are the same tactics the pros use to cream their competion and permanently stay on the top of the game. 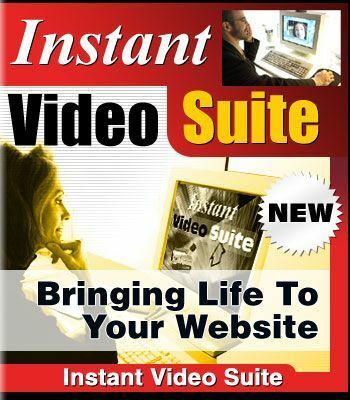 As the name suggests, Instant Video Suite is actually a suite of very closely integrated software that offers you a seamless way of creating video presentations without even realizing that youve used more than one piece of software for your project. This way, do not need to master any specific knowledge to use Instant Video Suite. -Sell it to end users without rights for $147 - $197! -Sell it with resell rights for $297 - $497! -Sell private labels with resale rights for $497 - $1997! -Sell the source code itself for $1997-$4999! -Use it yourself and blow your sales through the roof! NOW ONLY $24.95 WHAT A VALUE FOR YOUR MONEY ORDER TODAY!! !